One day a guy at the flying field gave me a box full of miscellaneous aircraft parts. One of them was this Ares. The wing, fuselage and tail pieces were all pretty much intact and with some foam glue and clear packing tape, it came out looking pretty good. Evidence shows that it went in pretty hard a few times. It`s amazing how accordioned the nose can get on these foamies and you can still get them into passable shape. The only electronics left on it were the flight surface servos. I managed to find in my leftover parts inventory a motor, esc and a 1200 mah 2 cell lipo All it needed was a receiver and a prop. Now that the last of the local hobby shops are gone, I got a 4 ch. receiver and a 9x6 prop from Horizon. With a little engine cowl modification, I got the prop on ok. Battery charged, bound to my DX6 and away she went! 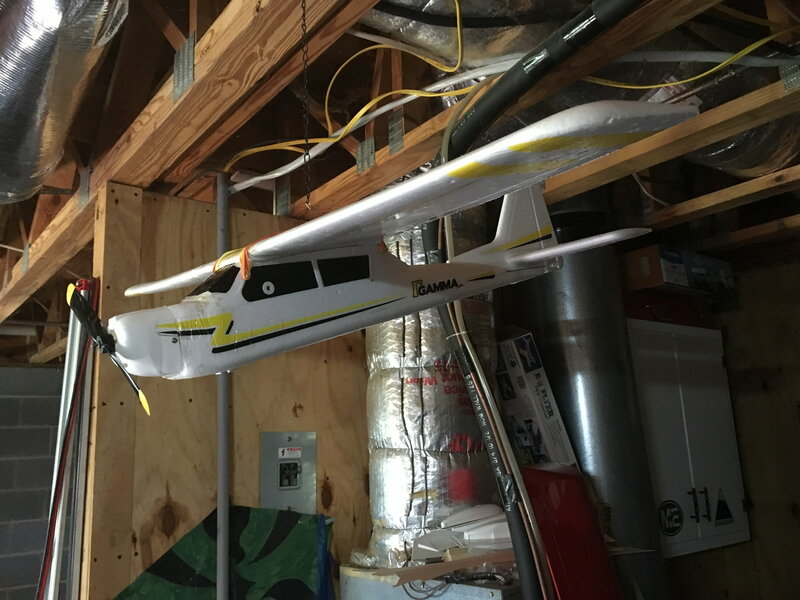 Climbed out pretty slow and once I got some altitude, it just needed a little left aileron trim. It`s obvious that she`s way under powered. Even though the motor fit on the square mount beam that sticks on the firewall, it`s probably too small. I`ll have to do some more research as I don`t know much about how to identify electric motor size. I think the prop size is right for this plane. Anyway, I thought I`d pass along this little story. I like to resurrect models without spending too much money, and here`s an addition to my backyard foamie fleet. Also in the box was a 64mm foam F-35 from FMS. Got it put back together but it`s still missing the edf and all the electronics. Thought I`d check back here. No one has one of these that cares to comment? I looked into these and found it needs a much bigger motor, esc and battery. Since I don`t have much at all in it, it would be worth re-fitting with the proper power and using it as a practice beater to work on more difficult maneuvers in my back yard.